This post also appears in a multi-part format on IndieGames.com. It's Indie Royale time again! Yet again they've managed to impress with a fantastic selection of games; the Indie Royale folks definitely deserve some applause for keeping up a pretty high standard of quality for the last several bundles, and this one is no different. This month we have a very popular tower defence/shooter mash-up, a expectation defying zombie puzzle and a slew of games from quirky publisher Digital Eel. Better yet, every game is DRM-free, Desura capable, and mostly able to be Steam activated with the exception of Weird Worlds and the bonus games. So what is in store? Skip past the break. 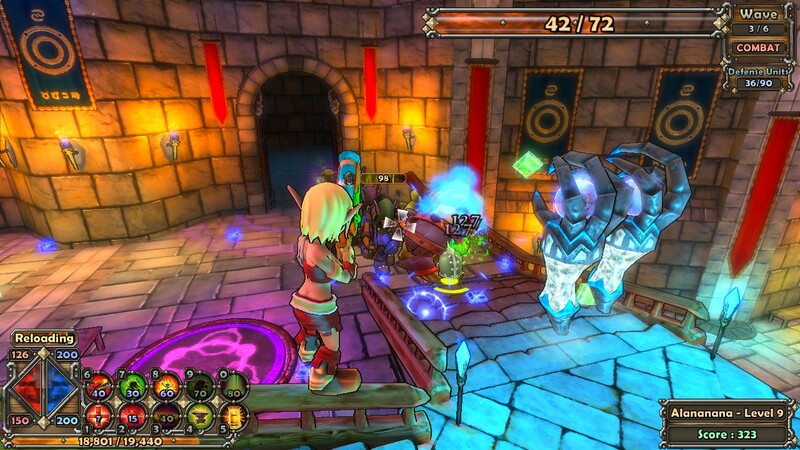 I'd be surprised to hear someone claim they're unfamiliar with Dungeon Defenders. Trendy Entertainment's runaway tower defence hit managed to build up a considerable community due to the strong focus on multiplayer and inclusion of several MMO elements. Combined with a steady stream of both free and paid DLC, and it's clear that Trendy's title is a game you can sink a ton of time into. But how about the underlying game itself? Well, let me tell you about my friend's reaction to this game rather than my own. I was having a hard time playing this game before I drafted a friend to play with; a lot of reviews from when the game came out focused on how it was very unbalanced for a solo player, and multiplayer was about the only way to play. They're basically right, as playing by yourself means that your sole class isn't versatile enough. Sure, you can level up a damage class, a tower class and maybe a utility class, then constantly swap halfway through levels, but that can double or triple the amount of grinding you must do and is just tedious. But back to my friend. He was quite skeptical at first because of a strong dislike for tower defence; I tried to explain that it was more hands-on like Sanctum or Orcs Must Die, but he thought it sounds "like DOTA" or something. However, once we both got the game working and joined a few others, he began to really enjoy the title, as did I. A lot of this fun comes from the hands on nature of a tower defence/shooter. There's never really any downtime as you always have towers to build or enemies to shoot. 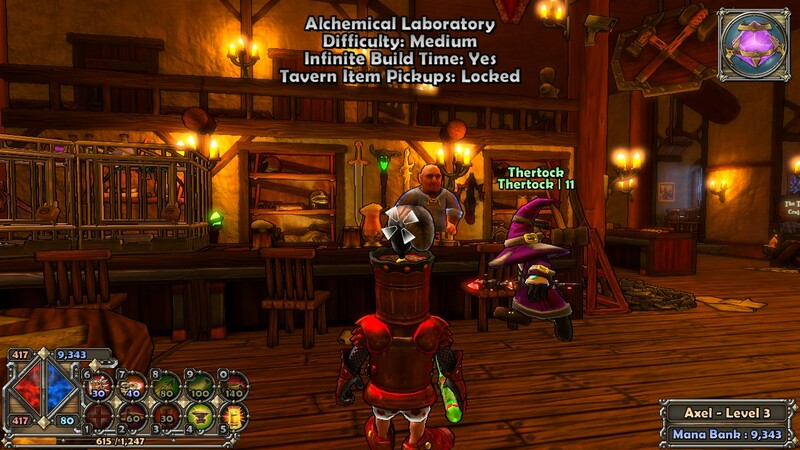 But Dungeon Defenders adds more of a meta appeal to the basic structure. It's pretty brilliant, actually. Trendy simply added in a hearty amount of MMO and even slight DOTA trappings to make Dungeon Defenders a multiplayer game to return to again and again in place of a single player one off experience like Orcs Must Die. Instead of levels, the maps of Dungeon Defenders each feel like an instance in an MMO; while the multiplayer lobbies certainly aren't massive, each level is a self contained loot filled extravaganza you can play with friends or strangers (though I would recommend the former). Even without the extra DLC packs, the base game includes tons of levels to work through, and the DLC expansions provide a natural outlet to move on to once you finish the game, or pick up when a hefty Steam sale crops up. It's a fantastic example of an alternative multiplayer for those who don't like the ultra competitive nature of most versus titles, but can't afford an MMO. Some of the genre's ugly aspects make an appearance like the emphasis on grinding or competition for loot, but overall it's a very successful MMO-lite experience with gooey tower defence innards. 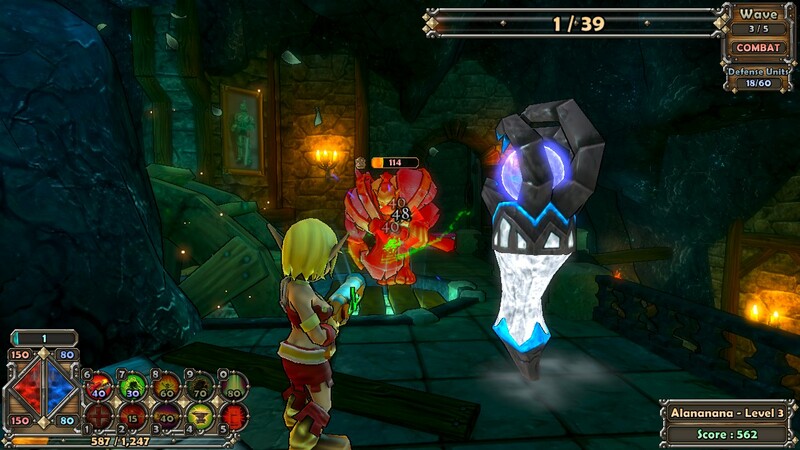 Playing by yourself would likely be frustrating and annoying, but playing with another either via local coop or the online community makes Dungeon Defenders an ideal option for coop focused players. Sick of zombies? I don't blame you, because there's definitely a few too many of the undead blighters showing up in games these days. Still, I was pretty happy to give Containment: The Zombie Puzzler the benefit of the doubt because, well, you don't often see zombie puzzlers. Luckily Bootsnake Games backs up the neat genre mash-up premise with a puzzle game that brings in unique mechanics, a great presentation and an excellent dynamic feeling to the levels. Let me just expand on all three of these points for you. First, the mechanics. While I might be a little tired of zombies, I'm far more burnt out on match three puzzles so looking at screenshots left me a bit wary of what to expect here. Fortunately Containment keeps far away from the usual coloured gems tropes. In each puzzle, you have four different types of humans—the usual match three colours—and a handful of undead. 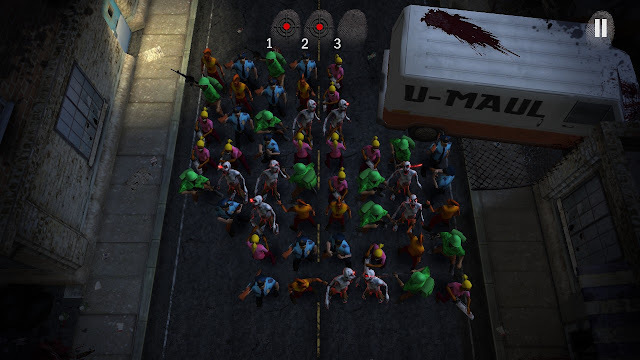 You need to swap humans and surround each group of zombies with matching ones so they can pull off some coordinated zombie slaying and remove the zombie pieces from the board. Of course, zombies aren't so inclined to just stand around and get shot, and they'll convert your humans into more zombies making it more difficult to surround them and clear the board. It's a fresh style of puzzle, and makes terrific use of zombie tropes to deliver interesting mechanics. So the base mechanics are great, but can they float an entire game? Not really, but that's where the great level design comes in. It may seem weird to discuss level design for a random puzzle game, but Containment does a great job with it. The puzzle boards are varied and dynamic, and random events and scenery can have a big impact. Sometimes a truck will block new human pieces from entering the board, or a clickable barrel will explode half of the pieces. 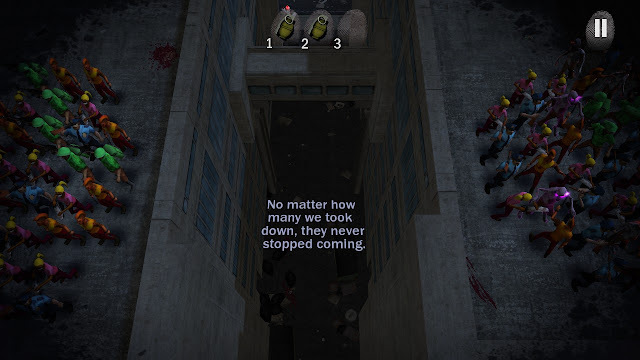 Zombies enter the board constantly from environment pieces like broken fences and hospitals, and sometimes even jump down from above. Even favouring particular humans influences the game, as that group's item will appear more rapidly. Like the grenade? Use soldier pieces more to get grenades to drop. It altogether adds a lot of much needed variety. The presentation deserves a mention as well. The game is divided into acts of five parts each, and each part is divided into several "blocks" of one puzzle per city block. After clearing the block, the camera pulls away and flies over the streets, offering morose text on the sides of buildings and in the ground to explain how the Franklin County pandemic came to be. It's moody yet cheesy at the same time, supported by the drive in move style menus and hilariously over the top lines the humans shout after particularly good kills ("Looks like you just got laid... to rest" is a particular favourite). The straddling of the line can be a bit alienating, as it seems like Bootsnake never really wants to commit to complete seriousness or full cheese. Still, the presentation is far above and beyond the usual puzzle game. The main audience might be iOS, but the PC version of Containment offers a pretty great casual puzzle game to fill just enough of your time without becoming unwelcome. 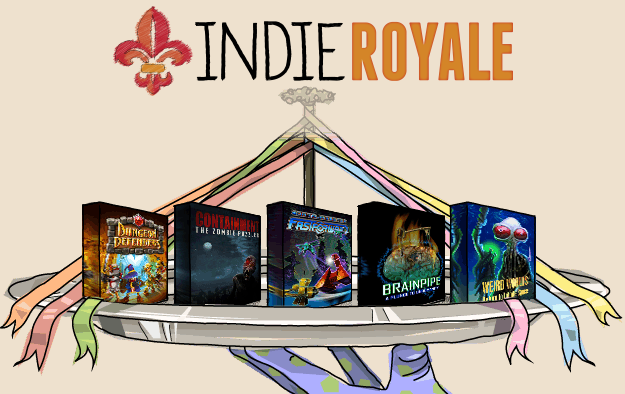 Better yet, the Indie Royale offers a chance for you to pick it up on a whim with four other games. Seems to me like a great way to try out a very unique puzzle game that ditches the worst tropes of the genre for zombie killing fun. Ok, let's make it clear first that for a game about a journey into the depths of the most complex organ in the body, Brainpipe doesn't have a lot of depth. 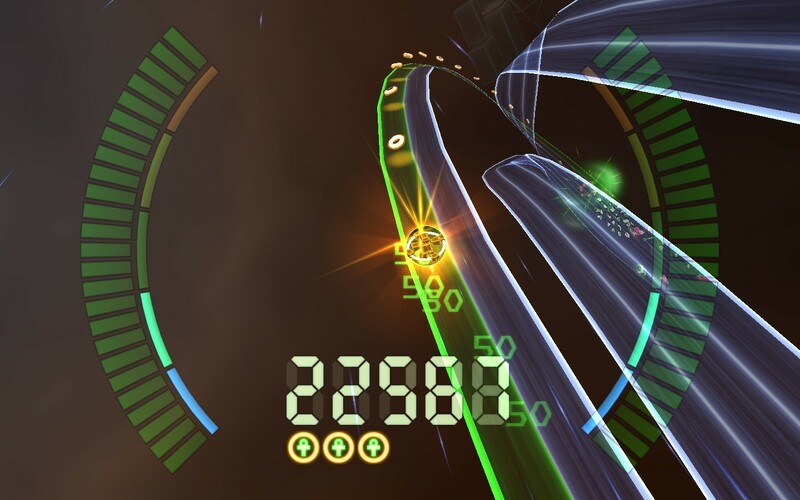 What it does have is high intensity arcade gameplay and a very slick audiovisual presentation. It may be fairly superficial, but Brainpipe is still a worthy artistic experience to try out. If you've ever thought the theme song for Doctor Who would make a fantastic video game, Digital Eel is here to test that theory. Brainpipe finds you plunging through a brightly coloured acid trip pipe from a first person perspective. All the while, you're dodging all sorts of harmful electricity, gates and tunnels while collecting glyphs. Each glyph is a facet of brain activity, and collecting enough of them ends the level, grants new a new aspect of critical thought and then begins an even harder level. Reach the end of level 10 and you ascend to a higher form of being; presumably a space baby of some kind. I say presumably because I didn't reach the end in my several attempts. It's not exactly a challenging game and I probably could have cracked it eventually, but it can get extremely hectic as the levels go on. Hitting an obstacle isn't the end of the world as your state of health is constantly regenerating. Hit several things in a row though, and your journey through the last twenty minutes of 2001 is at an untimely end. You do have the limited ability to temporarily stop and take a breather, but as the difficulty ramps up your desire to use it becomes more and more tempting meaning that often you won't have it when you really need it. Worse yet, just hitting one obstacle can throw you off and set out a cascade of errors. It's truly a game that requires a ton of concentration and quick timing. It starts out nice and slow, but before you know it you'll be rushing and panicking and getting all those fun emotions a really intense arcade game should foist on you. If you want a deeper experience, you should probably look to one of the other fine games of this bundle. Brainpipe is an arcade game through and through, designed with simple mechanics and yielding very focused gameplay. I don't want to abuse the word intense like I normally do, but that is the best way to describe it. If you like arcade classics, dodging things or trippy visuals, Brainpipe is worth the plunge. While it may not be labelled as such, this Indie Royale is definitely a tour de force for Digital Eel; you might not have noticed, but five of the games included came from their studio. And while the headliner spot belongs to the well deserving Dungeon Defenders, Digitial Eel has plenty of weird atypical goodness to offer alongside Trendy's tower defence. Data Jammers: FastForward is a perfect example of this. Like Digital Eel's Brainpipe, it's a high intensity arcade style game where you need to collect good stuff and dodge bad stuff. But while Brainpipe seems to ape space sims and trippy visuals for its arcade journey, Data Jammers goes in a very different direction. Data Jammers is all about taking the phrase information highway quite literally. You control a speck of data that zooms down a digitized highway, collecting points and avoiding defensive programs amidst a sea of benign data. When I say highway, I mean it quite literally as the game field is divvied up into a multi lane highway on which you constantly shift lanes. It's a very easy to understand system of green lanes are good and red lanes are bad, but the high speeds, loopy tracks and malicious enemies keep it from being that easy to master. Since it is the internet after all, the highway isn't exactly the most sensible or cohesive bit of civil engineering. Paths often branch, jump around, loop, twist and reform, with the use of twisted on and off ramps lending a roller coaster feeling to each level. It's not even close to the psychedelic weirdness of Brainpipe, but it serves the same purpose of kicking up the intensity and action beyond the more retro slate of indie arcade games. Data Jammers is also more of a well rounded package than the arcade purity of Brainpipe. While points are still the biggest incentive, there's more typical game elements included as well like distinct levels, AI powered enemies and even boss fights. Your data speck isn't exactly defenceless, but it is certainly limited. 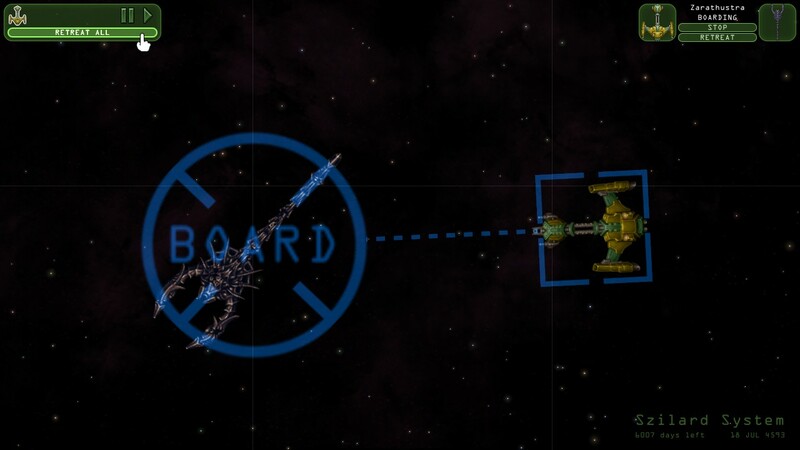 You know the screen killing bombs you get in seemingly every space shooter ever made? Well, those are your one and only weapon here, and they're just as limited. To defeat enemies, you need to outmanoeuvre them, shoving them into alternative routes and other baddies. It's a ton of fun, because you have the bit of strategic positioning and outwitting, but you're still moving blisteringly fast which means good reflexes and improvisation is the key skill. The mechanics are different from everything else out there and the visuals are fantastic. If you like your games fast and just ever so slightly out of control, Data Jammers: FastForward certainly lives up to its colonized subtitle. Let me tell you a little bit about Strange Adventures in Infinite Space. 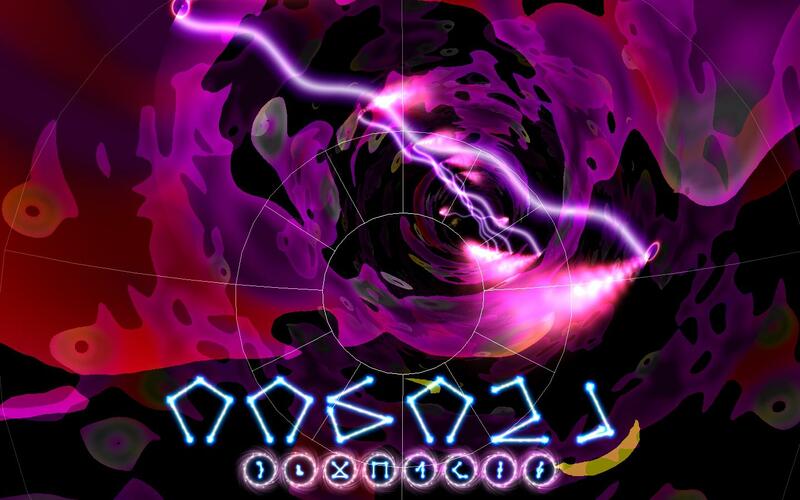 It's a small freeware game I downloaded on a whim a few years back, and I proceeded to be totally blown away by it. It was the perfect definition of a lunch time game, as every trek into Infinite Space would be wrapped up in twenty minutes or less. I survived many nights of university essay writing by taking Strange Adventure breaks every four hundred words or so. It was simple, addicting and short, a perfect combination. Three years later, Indie Royale blows my mind and reveals that there was a sequel this whole time. Trust me when I say I'm pretty biased here, but also believe me when I say this game is pretty incredible fun. In fairness, Weird Worlds is less a sequel and more of an enhanced remake where there's simply more of everything. The simple graphics of SAIS get an upgrade, but all the elements of Infinite Space are still present and instantly recognizable. 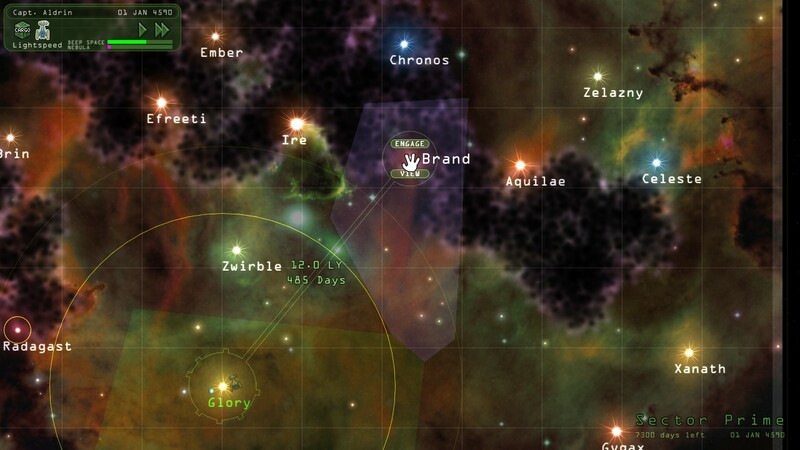 There's more gear to kit out your ships, more random events and planets to visit and more discoveries to make. But even with more of everything, the game is still quite simple. You are given a map of the sector, and simply click on which system you want to visit. Combat is generally infrequent, but operates like a very hands off RTS. 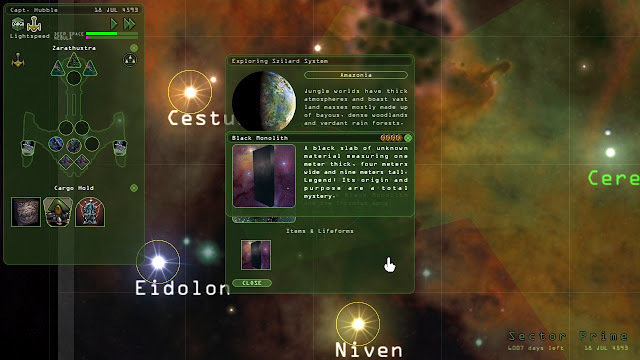 Like SAIS, Weird Worlds puts you in the role of starship captain, assigned to a twenty year mission in the "plausibly implausible" Purple Void sector. You get to boldly go on your very own little star trek, visiting planets and meeting aliens while upgrading your ship to perfect fighting form. You'll gather rare specimens, ancient artefacts and encounter a large variety of intelligent life. All machine race bent on destroying everything? Friendly hyper advanced friends to humanity? 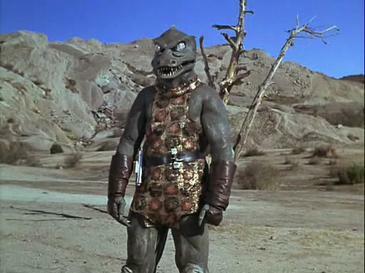 Warlike reptile race that could plausibly be a Gorn cousin? All the sci-fi tropes are dutifully covered. The awesome part of Weird Worlds is the sheer replayability. You can choose to start with three particular classes of ships; either a pacifist science vessel, an underground pirate smuggling ship or a top of the line human corvette. Each of the classes gives you a push in the right direction, but you can pretty much choose to do whatever you want once you enter the sector. If you want to become a passive scientist that runs away from all conflict, it's totally viable. If you'd rather be a Shepard style hero who assembles a team to take on a galaxy-wide threat, you can do that too. And that's all without touching the extensive mods that have built up for the game. The really jarring thing is that all of these adventures last no more than half an hour. There's a lot of roguelike elements at play; your poor captains will die plenty, there is no saving and a lot of it is luck based. But that's the fun of it; the twenty years of your mission will fly by, so the replayability comes from trying new roles and getting higher scores. Lots of games claim to be perfect for bite sized sessions, but Weird Worlds is one of the few that delivers a deep engaging experience as well. If the thought of yet another match three game makes you cringe, and the massive glut of physics based puzzlers just annoys you at this point, you probably won't be pleased to hear that Soup Du Jour is a combination of both. Don't run away just yet though, because despite my misgivings Digital Eel managed to combine these two elements into a very fun hook for a puzzle game. In Sour Du Jour, blobby shapes of various size and colour constantly drop into a slowly swaying pot. Drag matching shapes together and they'll bond; get four together and they'll disappear. The goal is to match enough groups of four together before you're completely overwhelmed. However, the challenge is to do so without causing your blobs of jelly to go flying everywhere, as losing more than five out of the pot is a game over. It's hard to tell from the screenshots, but the physics make the game tougher than it sounds. 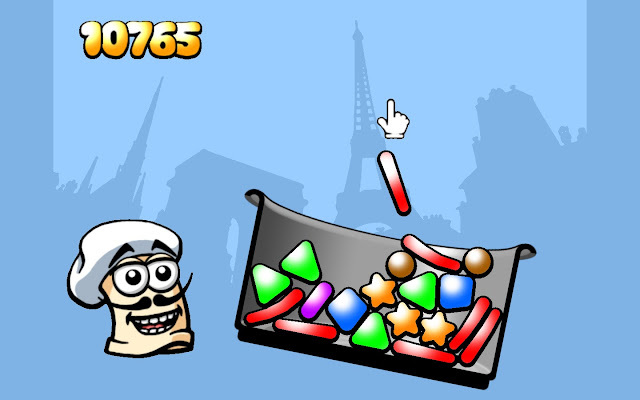 Simply trying to move one shape between the cracks of the others can have dire effects on the general stability of your soup, and bad elements like bombs, missiles and giant shapes try to mess things up for your high scores. As a bonus game, Soup Du Jour is a very pleasant surprise. I didn't think I had a place in my heart for another match three style game, but Digital Eel managed to make one that is a lot of fun to play. 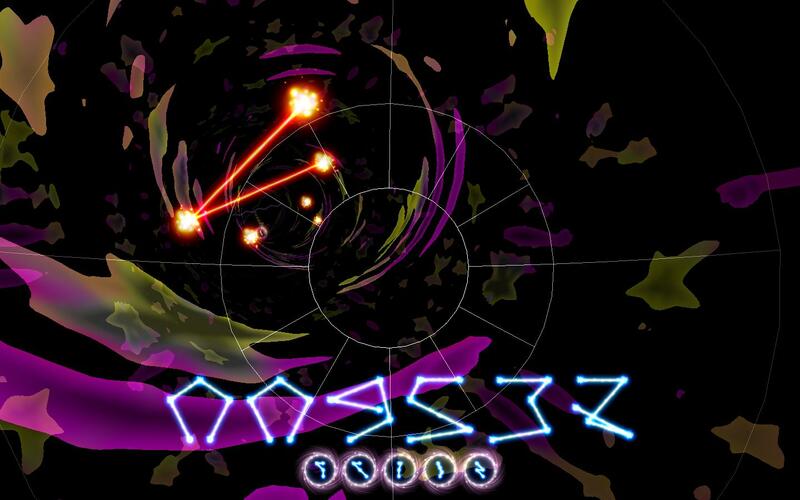 It looks simple, but the unpredictable physics adds a ton of chaos to the genre. Dr Blob's Organism is the other bonus Digital Eel game in the Indie Royale, and like Soup Du Jour it's a classic gameplay concept reworked into something new. This time, the developers take the basics of top down shoot em ups and mix in two major differences. 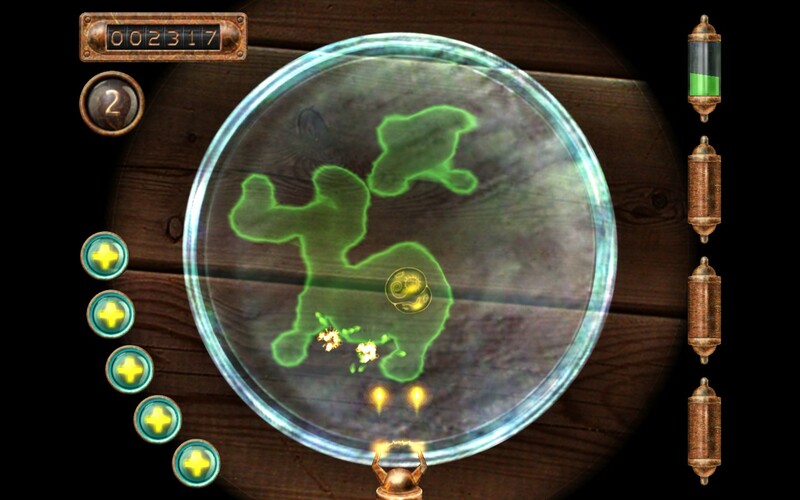 The game takes place on a Petri dish, where your gun is stationary but the field can be rotated to suit your shot. Instead of enemies, there is just a single cell that slowly expands its blobby influence. Let any bits of blob touch the sides and you lose a life. At first it's pretty easy, but as the game ramps up the blob replicates faster and your puny gun slowly becomes obsolete. The unusual perspective and amorphous enemy are the two main surface aspects of the game that tweak the shump genre, but it's the power-ups that really change the game design. The blob never really changes beyond expanding faster, but the wide array of power-ups and changes to your guns keeps giving you a fair shot. It's an interesting choice where the enemy stays constant, but the player is the one who constantly changes and expands in complexity. It's a neat early experiment in gameplay from Digital Eel, and a nice bonus alongside all of their other more complex games. 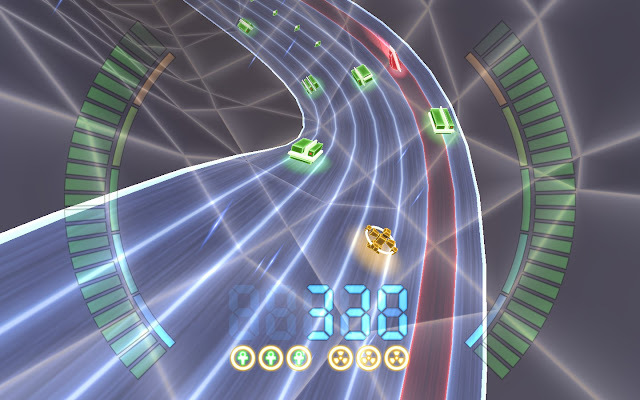 And like pretty much every other game Digital Eel included, it gets very hectic very fast. Definitely worth checking out alongside the other arcade titles if you like new ideas on the usual point scoring games. Well, that certainly is a fine mix of games. If you find yourself intrigued, go ahead and pick up your own Indie Royale by using that fancy bit of technomagery below. But hey, enough about them. Time to talk about me. You can check out my nonsense musings on Twitter, and keep up to date with the blog via Facebook and Google Plus. Sharing and telling your friends about the site is definitely the best way to show your appreciation for the site, and it helps me out a lot with new traffic and more backlog awareness, and ensures I'll be blogging on bundles for a long time. This is the best Indie Royale yet, in my opinion. It has managed to combine together a well known indie title with rather obscure ones. Always a good combination.